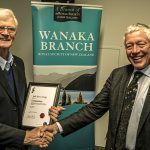 member of Wanaka Branch RSNZ. Records indicate that grebes (a rare and threatened species in NZ) first attempted to breed in the Roys Bay area in 2011-12 without success. Surveys of grebes beginning in 2013 on Lake Hayes, Dunstan and Wanaka were carried out with a view to gaining an understanding of the behaviour and breeding ecology of this species. Management of the species involved the design, building and management of artificial nest sites. The first of these was introduced to the Marina in 2013. The results have been surprising with 118 chicks successfully hatched to the present. Chick survival will be compared against over 150 hours of observations on Lake Hayes. It is suggested that a wider implementation of what had been learned may reduce the threat level to this species.